AJ-212S Iba na objednávku ! The World's Greatest Wireless Day/Night Infra Red Waterproof Camera with 18pcs Infra Red Leds. The Minimum Illumination Is Very Low At Only 0.00 Lux. It can be viewed at totally dark environment, with the aid of 18pcs high power high luminance wide angle LED with 880nm spectrum to optimize sensitivity situation. In day time, it will be in Color, but in night time or without enough light, the Infra Red Lads will be switched on automatically, it will be in Black and White. This is a brand new CMOS waterproof camera, with very low power consumption. Wireless1.2GHz 200mw high Frequency makes a large difference in the range and quality of b/w video received, especially transmitting through ceilings, floors and walls. Line of Sight is up to 1000 feet. Transmit through walls is difficult to predetermine, the range will vary a lot. This amazing device is ideal for covert or spy operations. It is very tiny you can hide it almost anywhere you like. If properly placed, the wide field of view angle enables you to view a whole standard size room. 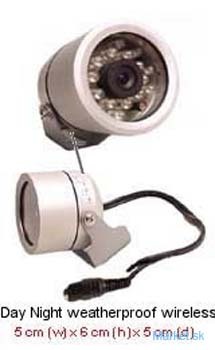 It is also great as a surveillance camera, a toy for hobby enthusiasts, as body worn solutions and so on. 6. Fit for the security system of stores, banks, hotels, school, hospitals. factories and apartments.